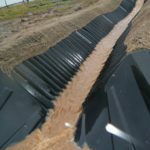 As is typical of most landfills, water accumulation on this UK landfill was creating a surface run-off problem during heavy rain events and causing severe erosion along many points of the landfill. 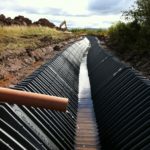 In the western UK, where rain is a fairly frequent event, the Whitehaven Developments Ltd site in Cumbria, chose to seek a better drainage and erosion control solution. To correct this problem, URS, the landfill owner’s engineering firm, designed a series of outfalls and lateral drainage channels to allow SmartDitch to redirect the cap water flow into a settling and retention pond.The severity of the slope grades were varied; with some as steep as 21%. In all, 5,695LF (1736m) of both 12”and 24”trapezoidal SmartDitch was installed (along with a series of fittings, flared-end sections and edge protection) to complete the drainage improvement system. 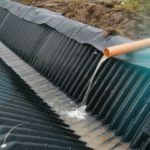 It took just 8 weeks to complete the project, which also included ditch prep, edge protection, and the installation of fittings and flared-end sections. 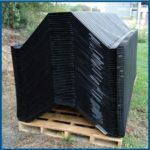 The flexible and lightweight design of SmartDitch also allowed the installation crew to work around existing site services, a leachate management system, trees, and shrubs. Download this case study as a PDF here.